The presentation consists of a short lecture, and a workshop. Let us carry out the following experiment with myself as "quiz-master". I have a tune in my head and I write out the rhythm of the tune. I then put the question: "What is the first note in the tune?" You then hazard a guess. Clearly, if you did not recognise the tune from the rhythm, the first note can only be arrived at by chance. I then tell you that the first note is, say, A. You write this note down and those who had guessed right draw a circle round their A. You then go on to guess the second note, the third and so on till the end. It is not a test of how well you can guess. This experiment shows how the reception of information is shaped by perceptual anticipation and the result will help us to understand what ‘Dissection of a musical text’ means. The period between two caesurae thus represents a significant unit of the text as interpreted by the hearer. It is clear that this unit can be meaningful but can also be completely meaningless if it does not correspond to the ‘meaningful unit’ conceived by the composer. The workshop demonstrates the very first stage of the method which is suitable both for students and children. We can understand a caesura between two musical phrases only if we understand a culmination in every phrase. The workshop shows how to understand the culmination and demonstrates the method in the form of stories and games as it is used for children 4-7 years of age. Concurrently it shows how to translate the rhythm into special form of solmization in order to write it out without counting the duration of the notes. I intend to explain this method in the same way that I explain it to children. I start off by asking. Do you know, what are we going to do now? We are going on a journey. One can travel by car, train or plane but we are going to travel in our chairs without leaving this room, because we are going on a journey through a magic country. In this country there are magic beings - dragons in fact. But they are not the usual dragons of all the other fairy-tales. Our dragons are invisible. It is possible to hear but not to see them. As all normal dragons they have tails and heads and every dragon has a collar as well so that it should be possible to catch him. I have already said that the dragons are invisible. But how can we hear them? Every dragon has little bells on his tail and his head and these bells ring when he moves. Although the dragons are invisible, you can imagine and draw them. This is a dragon I’ve drawn. He has only one tail and one head. Here is the bell on his tail. Here is the bell on his head. This is his collar. And this is the rope that ties the dragon together. Without the rope the dragon could lose his tail and his head. If the dragon moves his tail one bell rings [di]. 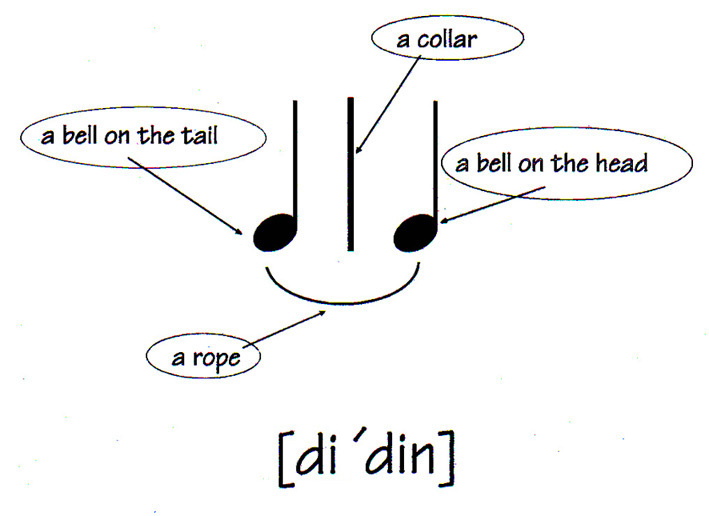 If he moves his head the other bell rings [din]. That is why the name of this dragon is [di-´din] (Illustration 2). To catch him we have to say his name and clap our hands. There are also other dragons who have no tails, but two heads. This is one of them (Illustration 3). Make it any way you can. If we shall try to catch dragons in some tunes, the first task is to answer the following question: How many dragons are there in the tune? The second task is to catch all the dragons without singing. The third one - to sing and to catch. The fourth one - to draw all the dragons in turn. It is a mistake to write all the notes and then all the bar-lines and phrase arches. You are only allowed to draw the next dragon if the previous dragon is finished - that means that you draw all the tails first, then a collar, then all the heads, then a cord and only then the next dragon. 4) the accent and the bar-line never coincide with one another. Unfortunately we have not enough time today to elaborate these cases. But especially interesting and complicated is the case where the accent and the bar-line never coincide with one another. The only way of understanding the regular metre in such a case is to hear the harmony. That is why it is impossible to learn the ‘Dissection of a musical text’ without acquiring feeling for and grasping harmony.